As the temperatures continue to drop this winter we suggest warming up with our line of Outerwear. In a time when men would not dare to be seen without a three-piece suit, whether inside or walking the streets, they used Overcoats to add that extra layer to protect them from the weather. These coats were designed to fit over several layers and generally had wider shoulders to accommodate the layers of dress underneath. 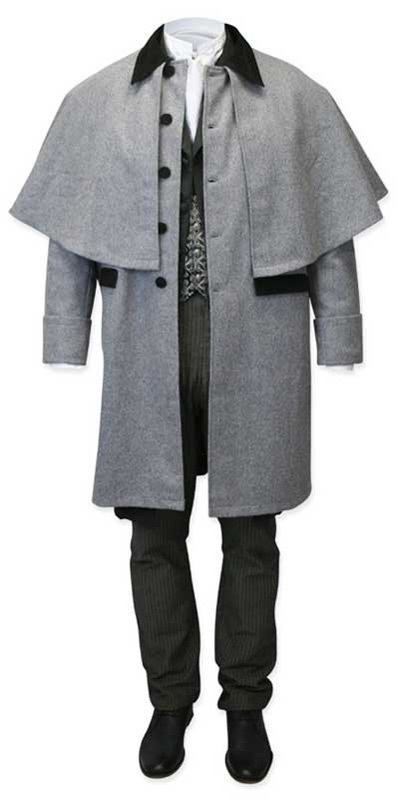 There are many things to consider before selecting the Overcoat that is right for you. The two biggest considerations are the time of year and the type of event. The fabric content on an Overcoat should be very important in your decision making process. Purchasing a heavy 100% wool coat to wear to an event in the middle of summer might not be the best idea. However a lighter weight wool, wool blend, or even a polyester overcoat might be a wiser choice. The type of event will also help determine which is the right coat. The more formal the event the more formal your dress; which includes your Overcoat. Double Breasted, Inverness Cloaks, and the dressier versions of the Inverness Coats are considered the most formal of the Overcoats. 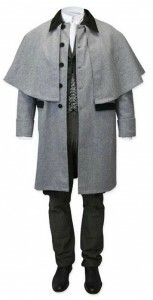 Overcoat: This is a general term that encompasses all outwear designed to be worn over another suit coat or jacket. 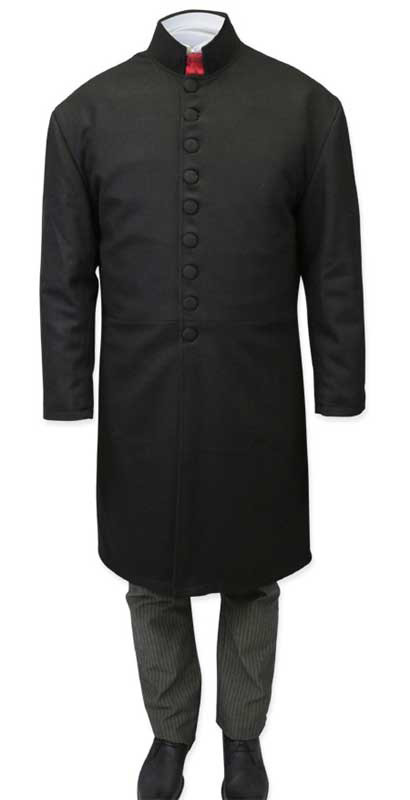 Typically, the overcoat, is constructed out of a heavier material than the coat/jacket underneath. Overcoats can have a varied length, at the knee or down to the ankles, and can be single breasted or double breasted. Chesterfield: This is one of the earlier styles of Overcoats and its creation is credited to the Earl of Chesterfield in the early 1800’s. As it was one of the first overcoats its name was used as a generic term for all overcoats no matter the style or shape in the 1900’s. The fabric used in a true Chesterfield varied from maker to maker however it was usually a heavier fabric in darker colors: Navy, Black, or Charcoal. The main characteristics of a Chesterfield are no waist seam, single breasted, velvet collar, and a plain back with a single vent. Topcoat: This is another term that has been used interchangeably with the term Overcoats. 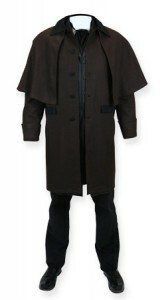 However, Topcoats are usually made of a lighter weight fabric and are typically about knee length. Greatcoat: These coats are typically made of heavier wool and are have more bulk than a standard Overcoat. A cowl or cape hangs over the shoulders and back to protect the wearier from the colder elements and to provide another layer to resist rain. 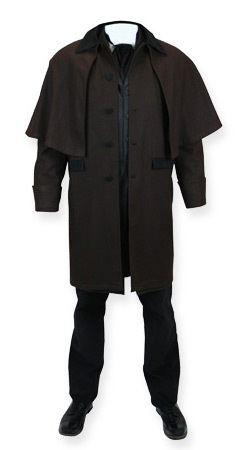 The length for Greatcoat is usually at or just below the knees and the cowl is fairly short, ending at the elbows. Greatcoats in a variety of styles have been popular with the military. Inverness Coat: This is a more formal and lighter weight version of an overcoat that resembles the greatcoat in cut and style. 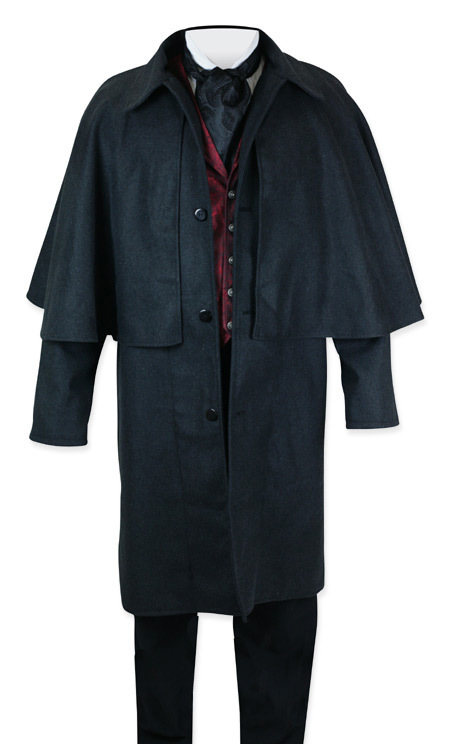 The Inverness Coat features full sleeves and cowl to protect the wearer and his dress suit. This style was most popular in the early 1800s, but was ultimately supplanted by the Inverness Cloak. Inverness Cloak: A latter day variant of the Inverness Coat. The Cloak does not have full sleeves. Instead the undergarment is designed with large armholes to reduce the bulk of the coat and allow gentleman more freedom of motion. 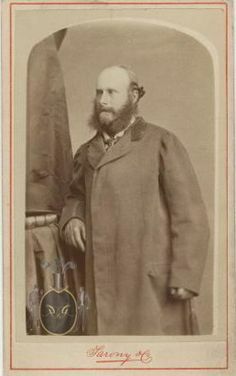 The Inverness Cloak gained popularity in the latter half of the 19th century and was most often worn for dressy affairs. Frock: Frock Overcoats are very similar to their suit counterpoint. They still have waist seams and notched collars but are much longer in length. 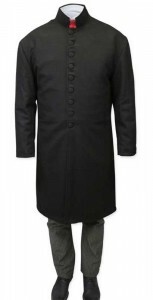 The Frock Overcoat is typically an ankle length coat and can be made from similar fabrics as the shorter Frock Coat. With so many varieties to choose from we know you will find the one that is right for you. Whether you want knee length or ankle length; single breasted or double breasted we’ve got you covered (literally). To view our entire line of Gentleman’s Outerwear, please click here. Which one do you plan on wearing this winter? Let us know!